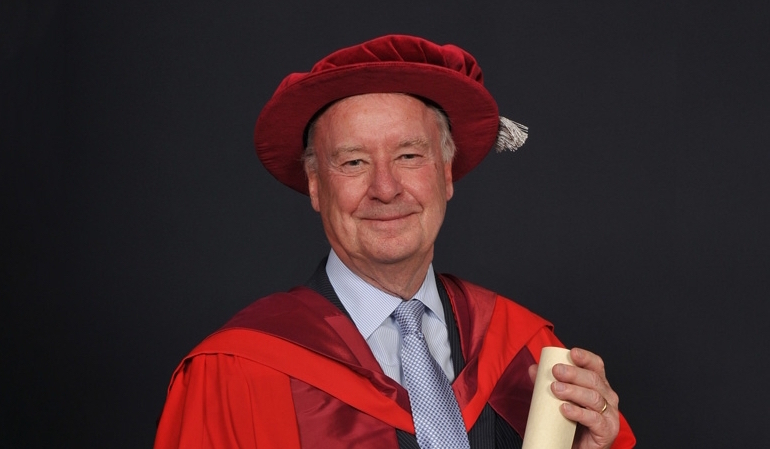 Peter Anwyl, Executive Director of International Students House (ISH), has been named Honorary Doctor of Letters (DLitt) by the University of Westminster. The award was presented at the University’s autumn graduation ceremony at the Royal Festival Hall in London on 21 November. The University of Westminster recognised Peter Anwyl for his personal commitment to the furtherance of international understanding and international education and for his continued dedication to the development of partnerships and scholarships for international and UK Home students through his work at International Student House. ISH was founded for the betterment of international understanding and provides a unique social, cultural and recreational centre for international and British students alike. They, together with the support of partners such as the University of Westminster, enable university students from the developing world to study in London. Last year the scholarships offered by ISH enabled 37 students to come to London for a life changing opportunity and experience which they can take back to their home country. In the last two years ISH has contributed almost £190,000 towards scholarships for 23 places at the University of Westminster, the most diverse university in the UK, US, Australia and New Zealand according to the Hotcourses Diversity Index (HDI). ISH and the University of Westminster work together to provide joint scholarships where students receiving a tuition fee scholarship from Westminster can also be awarded an accommodation scholarship at ISH. In 1993 Peter was appointed as the Executive Director of International Students House which was established in Regent’s Park in 1965. He is the Secretary of the International Students Trust and the Toyota-Shi Trevelyan Trust. He is a former university Governor and retired Chairman of the Finance Committee of the Lutheran Council of Great Britain. Peter was Chairman of the WYSE Travel Confederation sector association STAY WYSE between 2007 and 2009. Peter is retiring from ISH at the end of this year. WYSE Travel Confederation Director General David Chapman, who worked for Peter Anwyl at International Students House for seven years said “I am delighted to see that all the hard work, dedication and leadership Peter has put into International Students House has been recognised by Westminster University. The work that ISH does each year goes so far towards helping global understanding and tolerance. We all wish Peter a long and happy retirement”.